The Korea Foundation, working in partnership with the Embassy of Kazakhstan in Korea, has organized a photo exhibition that illuminates the urban and natural wonders of the Central Asian giant at KF Gallery in Seoul. The event, which runs through Saturday, is organized in collaboration with Kazakhstan’s Foundation of the First President. For the second time here, it shows photographs of the country’s capital Astana and natural landscapes by Kazakhstani photographers, continuing from previous showings in Russia, Georgia, Hungary and China since 2014. Kazakhstan Ambassador to Korea Bakyt Dyussenbayev participated in the opening ceremony Monday alongside diplomats, journalists and students. Traditional Kazakh music and lectures on Kazakh culture marked the opening. Astana, with a population of over 1 million people, has been the Kazakhstani capital on the international stage since 1998. Bisected by the Ishim River, Astana was rapidly constructed by the state to open in 1998, following the government’s decision to relocate the capital from Almaty in the southeast. 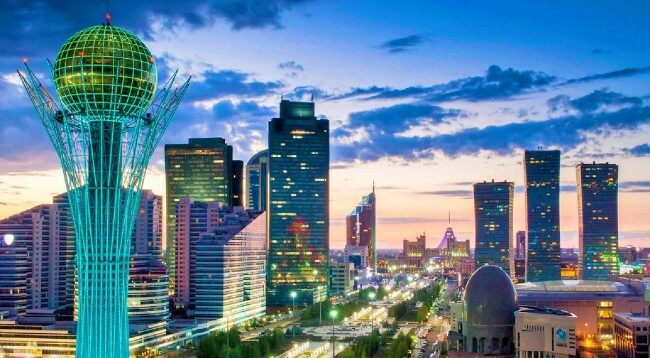 A planned metropolis, Astana is one of the most modernized cities in Central Asia. It has wide boulevards, spacious parks and futuristic-looking buildings designed by world-famous architects, a glitzy melting pot combining Central Asian, Russian and Islamic influences. Temperatures can soar over 35 degrees Celsius in summer, and dip below minus 40 degrees Celsius in winter. The event features various photographs of Kazakhstan’s vast and varied landscapes. Covering 2.7 million square kilometers, the country is the world’s ninth largest in terms of landmass -- roughly equivalent to the whole of Western Europe. It is also landlocked straddling Europe and Asia. Its topography includes vast steppes, mountains and mountain ranges, lakes, deserts, grasslands and canyons. Kazakhstan has abundant mineral and fossil fuel resources. Its petroleum and natural gas reserves -- the world’s 11th largest -- have fueled the country’s steady economic growth since 1993, when foreign investments began to pour in. Kazakhstan also has significant deposits of uranium, chromium, lead, manganese, copper and zinc, and ranks in the world’s top 10 for coal, iron and gold. It is also an exporter of diamonds.